The signature 篁子生, Kou-shi-sei forms the basis of the titles for both series in the 篁子生画選, Koushisei Gasen, Project. However on woodblock prints it is an uncommon signature variation used with only a few designs. 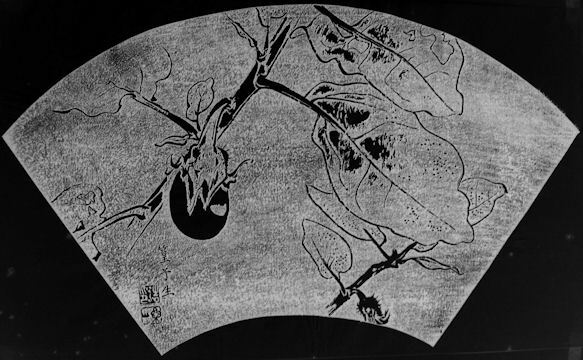 Rakusan soon elaborated this signature to 楽山篁子生, Raku-zan Kou-shi-sei, which is found on most later woodblock prints. Rakusan did not include the Fan Series in his main sequence numbering. Therefore, the original number used for each of the 36 Series prints has been modified to identify the Fan Series members of its theme. The five different fan silhouette shapes have been here assigned arbitrary numbers 1 through 5. To indicate a fan design these shape designations are added to the 36 Series number separated by a hyphen. 109-1 is the Fan Series design with fan shape 1 in the 109 Eggplant theme. Like all other designs in this series, 109-1 was only produced in a single print run, and few copies are currently documented. The 109 Eggplant theme is one of the many entirely regular themes represented by a complete fan quintet and a color woodblock print. The Fan Series prints of the 109 Eggplant theme were distributed in early 1934 in installment three (of twelve). The delivery documents for installment three remain to be discovered, but its delivery month was either March, April, or May 1934. The individual woodblock prints would have been printed earlier in the same month as their distribution. In early 1934 when Rakusan did a major rearrangement of his themes, he placed the only themes with vegetable and fruit subjects in consecutive order. What became the 109 Eggplant theme was used to finish out installment three, and the three fruit themes (what became themes 110, 111, and 112) immediately followed as as installment four. The composition of 109-1 shows a two sections of eggplant with leaves, a young fruit, and a maturing fruit. 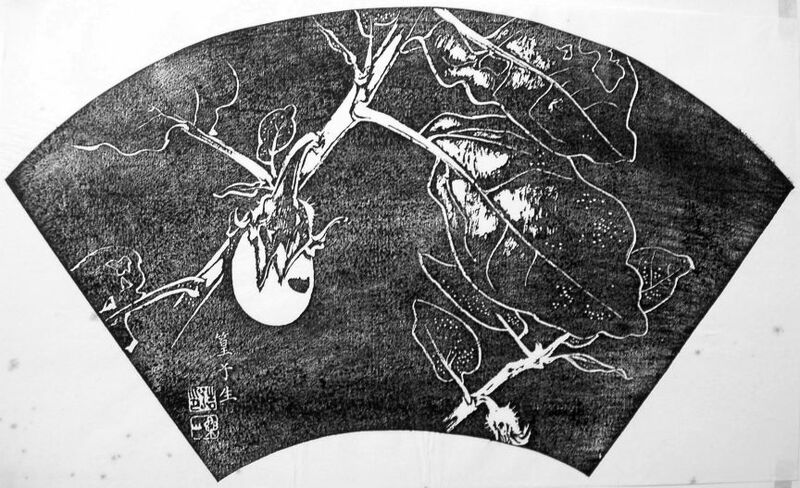 The eggplant is rendered in a loose flowing style with bold lines and solid highlights which works equally well either as ishizuri or in the original sketch. Eggplant (Aubergine), Solanum melongena, 茄(子), なす, ナス, nasu, is originally not native to Japan. However, it was imported during prehistory as an agricultural crop. Eggplant comes in many varieties, shapes, and colors.